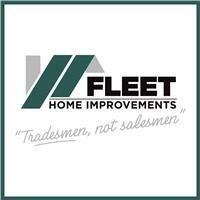 Fleet Home Improvements Ltd - Bathrooms, Builder, Fascia/Soffits/Guttering, Kitchens, Windows/Doors/Conservatories based in Weymouth, Dorset. At Fleet you will always receive a top quality and professional service at competitive prices. The company was founded by Director Liam Coles of Weymouth and is a family run business, with over 35 years experience in the construction industry. The company work with a professional team of tradesmen who consistently deliver outstanding service and a first class workmanship. Every building assignment, no matter how small is project managed from start to finish to ensure a clean and efficient job right through to completion. All of our work will be carried out to the highest of standards and of course protected by our personal guarantee and public liability insurance in excess of £5 million. You can trust that Fleet Home Improvements Ltd to exceed your expectations and get your job completed - service with a smile. For a no obligation quote for any of our services just pick up the phone and ask for Liam.